This is a New York City restaurant in Manhattan. Don’t miss out on this favorite. This is a tasty sandwich. Junior’s Recipes can be found at Amazon books. 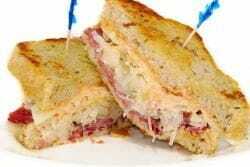 You can make a great Junior’s Reuben Sandwich at home. Melt the butter on a hot grill or in a large skillet. Grill both slices of bread on one side. At the same time, grill the corned beef in one stack and the sauerkraut in another. Cook until both are heated through. Turn over one slice of the bread on the grill. Stack on the corned beef, top with the sauerkraut, then the cheese, and the second slice of bread, grill side down. Continue grill the Reuben until it's hot and melted, turning the sandwich over once. This usually takes place in 5 to 7 minutes. Serve immediately, hot off the grill. FYI – Junior’s is in both locations…Brooklyn is the original location then branched out to Manhattan. Most restaurants in these parts that serve what they call a Reuben slather them with Thousand Island dressing. Yuck! I have them make mine with a shmear of spicy mustard since Russian dressing is a rarity here. I find with dressing a little goes a long long way. Sorry Russian dressing is unavailable where you live. You must live way out. ha ha My wife will only use 1,000 and I prefer Russian and yellow mustard. Hard to believe a NY Deli serves a Reuben without dressing? I need to try making some homemade Russian dressing. There is also a Junior’s in Manhattan! It was so good that I ate there 3 times while I was in the city. The matzo ball soup, the brisket sandwich and the hamburger!…So good! I have been at the one in Manhattan, I believe it is near the theater district. This Ruben Sandwich is really good! I made these for a Saturday lunch and the whole family loved them!